Historic newspapers are an important resource for African American genealogy. 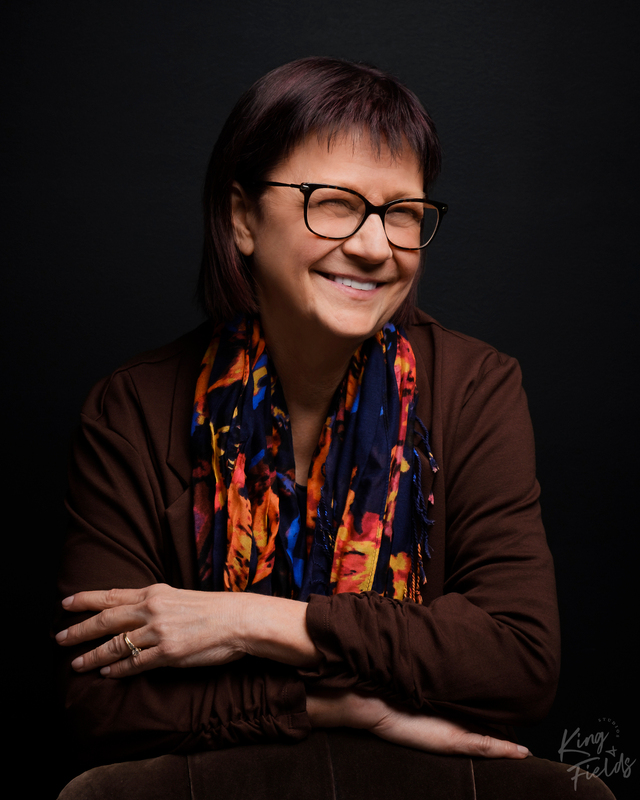 Runaway slave ads, jailor’s notices of captured runaway freedom seekers, notices of estate sales, private sales and sheriff’s sales that include the names of enslaved ancestors are all important for understanding enslaved ancestors’ experiences. Today, we focus on advertisements for Sheriff’s sales, what those advertisements tell us, and what leads they provide for further research. 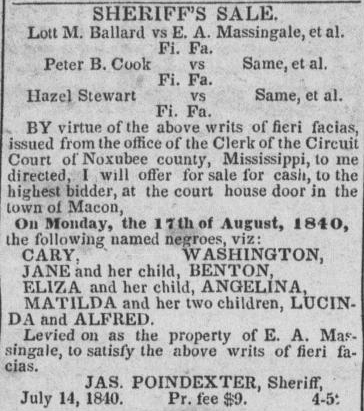 Notices for Sheriff’s sales often include a reference to a “fi fa.” What is a fi fa, and what can these words tell us in our search for enslaved ancestors? A fi fa, or writ of fieri facias, is a writ issued by the court after a judgement in a legal action for debt or damages. The fi fa instructs the sheriff to sieze and sell property equivalent to the value of the judgement against the debtor. How is a Fi Fa Notice a Clue for African American Genealogy? Identity of the Slaveholder for the Enslaved People being Sold: Seeing a sheriff’s notice to sell enslaved ancestors as the result of a fi fa tells us, first, that the person whose property was seized is a confirmed slaveholder for your ancestor. The advertisements usually contain a phrase such as “Levied on as the property of E.A. Massingale,” as in the advertisement below, which identifies the slaveholder. Clues for Finding More Documentation: Second, a mention of a fi fa tells us that there should be a record of the legal action and the court’s judgement. In the sheriff’s sale notice below, the court and the legal actions are listed. We see that the three suits were filed in the Circuit Court of Noxubee County, Mississippi. The suits were Lott M. Ballard vs E.A. Massingale, Peter B. Cook vs E.A. Massingale and Hazel Stewart vs E.A. Massingale. Let’s scroll down the Wiki page to the section on court records. Here we see that the county courthouse has records for the Circuit Court, beginning in 1834. 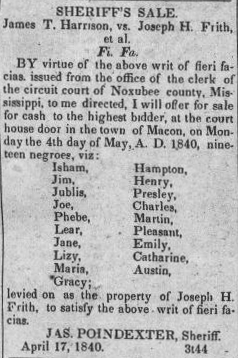 The sheriff’s sale in the advertisement above was advertised in 1840, so the court actions that led to the fi fa may be among the Circuit Court records in the Noxubee County, MS courthouse. 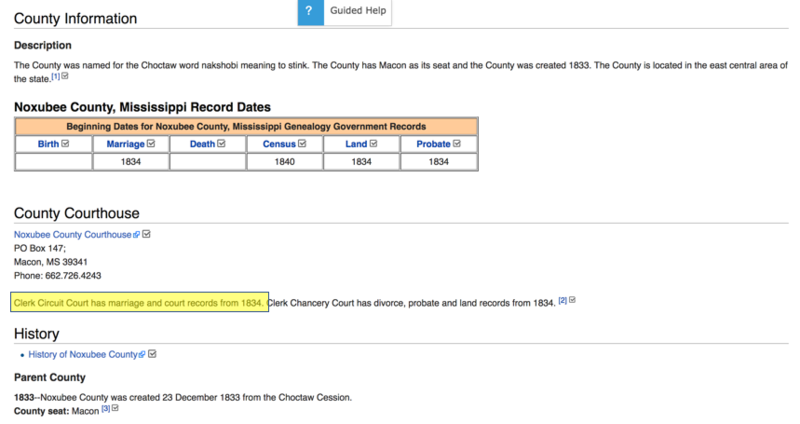 As you see, the Wiki page gives us the contact information and address for the Noxubee County, MS courthouse, so we can contact or visit the courthouse. Have you located an ancestor in sheriff’s sale advertisements? Tell us about it in the comments below!